As a recent convert to Islam, I’m still learning. A lot. At this point in my religious education, I feel like I’m somewhere between half-day kindergarten and all-day kindergarten. At the mosque near my home, most of the brothers speak Arabic as a first language, or at least speak it so fluently it may as well be their first language. That’s not me. Beyond basic greetings, some lines during prayers and a few words and phrases here and there, I don’t speak Arabic. Alhamdulillah, just this week I began learning the Arabic alphabet from a brother kind enough to be willing to teach me. So the other day, I was entering the mosque for dhuhur (afternoon) prayer, and a brother asks me something in Arabic, of which the only word I could make out — or at least I thought I made out — was wudhu, the word for the ablution before prayer. Since many brothers and sisters are stopping by the mosque during their workday, many perform wudhu at the mosque. Since I live just a couple of blocks away from this particular mosque, I’d performed wudhu at home. So I thought the brother was asking me if I’d performed wudhu, and I nodded. Next thing I know, he’s summoning me to the front of the room and trying to put a wireless mic on my shirt. Turns out he wanted me to lead the group in prayer. In Arabic. While this is something I hope to do someday, inshallah, I had to let him know I wasn’t able to do it that day. The incident reminded me of something we see in sports more and more often now. When the NFL Draft gets underway on May 8, three or four (likely more) of the quarterbacks picked in the first couple of rounds will be asked and expected to step up and lead their team from the moment they walk onto the field as a pro. And for some of those QBs, even if they want that job now — even if they may grow into being an effective leader in the future — they just don’t have all of the tools to take on that responsibility yet. Don’t get me wrong. Some will succeed right away, like Andrew Luck did in Indianapolis. And others may be ready to lead sooner, but will have to wait their turn until later, like Aaron Rodgers had to in Green Bay. But there are others who will be knocked down and will have to get up — more than a few times — before coming into their own as leaders. Think Alex Smith in Kansas City, or Eli Manning in New York. And, yes, there are others — a lot of others — for whom it will never happen, even after a reasonable amount of second chances and clean slates. What they all have in common is they should be shown more patience and tempered expectations than today’s fans, media and even their own teams seem willing to give. Our culture around sports has become so critical, cutthroat and impatient — increasingly so as the money at stake increases — that we create a system in which many rookies are thrust into sink-or-swim leadership positions before they’re ready. And as soon as they begin flailing and looking a bit uncomfortable in the water, plenty of people will be there to hold them under. Making matters worse, the alternative is rarely an option. Once upon a time, high-profile QBs commonly sat on the bench their rookie year, just watching and learning like a college redshirt. Not only did they get that season to learn the playbook and practice without the high expectations to win, but they also got that season to adjust to life off the field as an NFL player. That’s not the case anymore. Franchises that draft QBs in the first or second round are typically in rebuilding mode, either introducing a new front-office/coaching regime, or working with a slumping regime trying to stay employed. Nine times out of 10, a struggling franchise doesn’t feel like it has time to be patient. Players have their role in creating the brutal cycle, too. They’re competitors who want to play as much as possible, especially at a position like quarterback, for which there can only be one on the field at a time. The other reality is that most players don’t want to delay their opportunity or shorten their window to get as much money as possible in the league, considering their career could be over on the next snap of the ball. So while the smartest move for, say, the Texans this year might be to draft QB Johnny Manziel with the No. 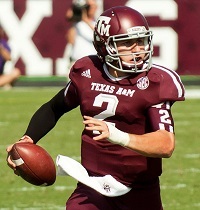 1 overall pick, then give him time and space to develop into a solid starter, Houston would more likely take Manziel (a local star from Texas A&M) and start him right away — sink or swim — to appease its fans and make a statement that these are the new, improved Texans, with shiny new parts and everything. The thing is, every quarterback needs three key things to succeed in the NFL, and more often than not, losing franchises are where they are because they can’t provide those three things: Stability, patience and a decent offensive line. Quarterbacks who play for three offensive coordinators in three seasons, quarterbacks who are given a handful of starts to make magic before their leeway disappears, quarterbacks who are constantly running for their lives … they don’t succeed no matter how talented they are. Trust me: I’m a Cleveland Browns fan. I’ve seen it too many times. And every time you start over, on the field or in the front office, you risk digging the hole even deeper and getting farther away from being able to give that QB what he needs. And when the QB does get those three things, who’s to say exactly when he should be ready to turn his team into a title contender? Ben Roethlisberger won a Super Bowl in his second NFL season. Peyton Manning took nine years to get it done. Russell Wilson took his team to the playoffs as a rookie and won his first playoff game. Matt Ryan took five years to notch a W in the postseason. Patience is not a flaw when choosing a leader. Nor is maturity and experience working up from the bottom a detriment for those chosen to lead. That’s why we have an age restriction on those eligible for high political office. That’s why we have entry-level jobs and erasers. Teams like the Texans, Jaguars, Browns and Raiders that are in the market for Franchise Quarterbacks in this draft — along with their fans and those who cover them in the media — should consider history and common sense. Whether you get Manziel or Teddy Bridgewater or Blake Bortles or Derek Carr in this draft, give it time. You might have the next Tom Brady on your hands, or you might have the next Tim Couch. But you’re not going to know after one or two starts, even one or two seasons. Like the new convert trying to learn a religion and its practices, he’ll need time. He’ll have to study the books. He’ll have to watch the veterans. He’ll have to find mentors. He’ll have to adjust to the lifestyle change. If he has the desire to lead, he’ll work at acquiring the tools. But don’t expect him to find his way right away. The Prophet Muhammad (peace be upon him) was 40 years old when Allah chose him to be His final messenger. Muhammad may have, on the surface, been equipped with the tools to lead earlier in life, but was not given the immense responsibility of revealing Allah’s message to the world and spreading Islam until he was ready. And look at what Muhammad did once he got the job.